The graduate programs in English at uWaterloo have been expanding in recent years, but we are always interested in enrolling more students. Recently some members of faculty and staff went on trips to recruit more graduate applicants. For those who went on the recruitment trips it was an opportunity to see different parts of the country and to talk to colleagues and students from other universities. 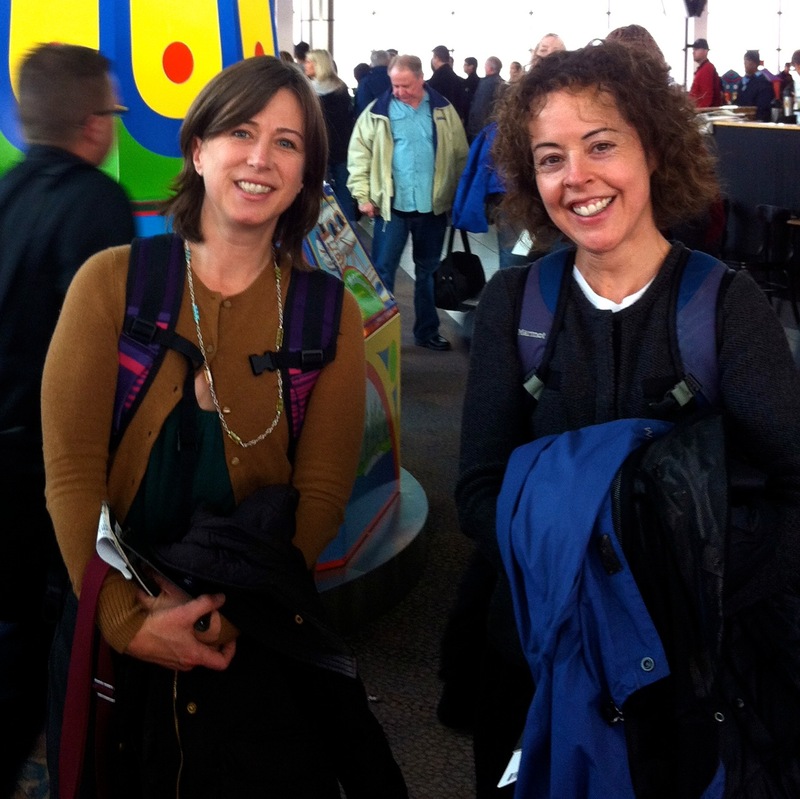 Professor Kathy Acheson and Professor Shelley Hulan went West. I snapped this photo on a rainy but warm morning in early November on English Bay. 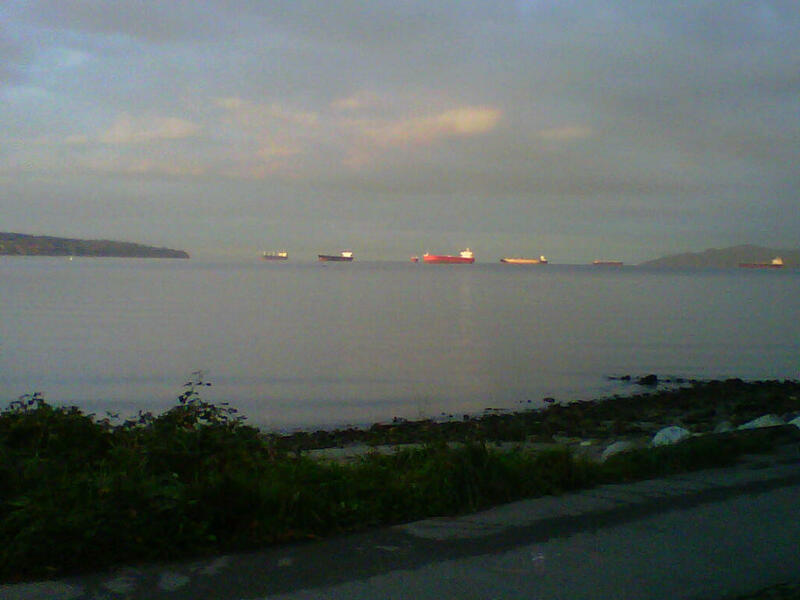 If you’ve read Ethel Wilson’s novella Love and Salt Water, you’ll recognize these cargo ships twinkling in the Vancouver harbour, a favourite literary opening of mine. One of the greatest things about researching Canadian literature is that you begin to see the national geography, already stunning, through the imaginations of Canadian writers. And that means that you never see just one vista in front of you. You see your experience layered with those of the narrators through whose eyes you are privileged to look. My colleague Kathy Acheson and I were on the West Coast to spread the good word about the English Department’s Master’s programs at universities in Vancouver, Victoria, and Calgary. Some of you pursued your MAs at uWaterloo and know that we’ve long had two MA streams, one in Rhetoric and Communication Design (formerly Rhetoric and Professional Writing) and one in Literary Studies. Since students in the two streams take a combination of Lit. and RCD courses, there’s a fair degree of cross-pollination between them, which grads consistently tell us was one of the illuminating aspects of their degree experience here. Last year we added a third MA in experimental digital media (XDM) that gives students the opportunity to “use…digital media as a critical tool combining theory and practice in the production of objects-to-think-with” (go to http://english.uwaterloo.ca/MA-XDM.html for more information). Like all our MA programs, XDM is available as a co-op degree; uWaterloo is, after all, a leading North American co-op university. English students earn money and gain valuable work experience at such companies as RIM, Microsoft, Design2Learn, and Google to name a few. So Kathy and I talked, and then we listened to some great questions from the floor. We so enjoyed meeting all of you who came out to hear us. Special thanks to our terrific hosts Lee Easton (Mount Royal University), Adam Tindale (Alberta College of Art and Design), Bart Beaty (University of Calgary), and Amy Machin and Joy Poliquin (University of Victoria). Most memorable? I’ve been to Calgary and Vancouver before, so I knew enough to look forward to being in beautiful places. But I didn’t expect the cappuccino in Calgary to be so great—that was a welcome surprise! Your admin’s comments: Common themes? Fabulous hosts, keen students, harbour scenes, and coffee.